Do you know the chances of winning the multi million jackpot prize in the lottery? The obvious answer is 'very small'. However I'm talking about the actual mathematical probability. 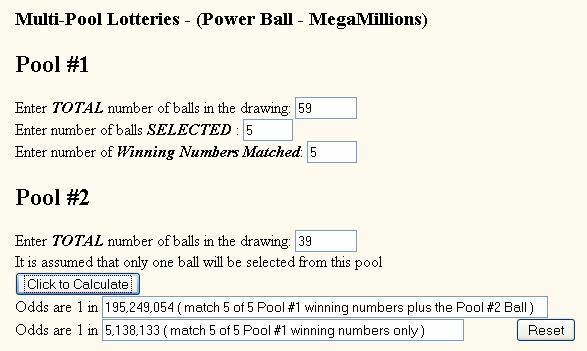 I would assume that most if not all state lotteries publish the odds of winning their lottery games on their website. If you want to know the odds of your state lottery then I'd check out their website. It should probably be posted there somewhere. You could also do a google search for keywords including "odds winning" and your state lottery. e.g. for the Wisconsin state lottery search for "Wisconsin lottery odds winning". The odds for the multi-state Powerball lottery are published on their site. The odds of winning the Powerball jackpot are 1 in 195,249,054. They have smaller prizes with crappy odds too. For example the odds of winning $4 is 1 in 123. Clearly the Powerball is a poor gamble if you look at the odds. If you want to know the odds of any lottery style game then you can figure them yourself using the lottery odds calculator. Of course I don't think its really necessary to verify the odds that the lottery program quotes. Its hardly something they'd lie about since its easily verified and such blatant fraud would serve nobody. Why do lottery odds matter? Well for one you should realize how very high the odds against winning really are. Hopefully we've all heard by now that winning the lottery is very very very rare occurrence and you're more likely to be hit by lightning. Another reason to know the odds is so that you can pick the lottery games with the better chances. If you're going to play the lottery (for fun only) then you should at least pick the one that has better odds.